Since the launch of YouTube Red, there have already been a couple of minor updates to fix little bugs and make further tweaks to the interface. The most recent upgrade, version 10.43, just started rolling out this morning and it appears to share the same purpose. However, a teardown also reveals YouTube is preparing to introduce a feature many of us have been dying to see: fast forward and rewind. Left: previous versions. Right: latest versions. There were a few visual tweaks in this version and the last. 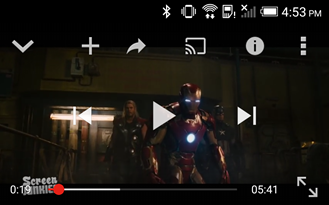 This release changed the icons in the playback overlay to smaller, sharper images with a brighter white color. The Add To List and Full Screen icons have been entirely replaced. The new set certainly looks cleaner and more refined. There were also a couple of changes made in the v10.42 update from a couple of days ago. 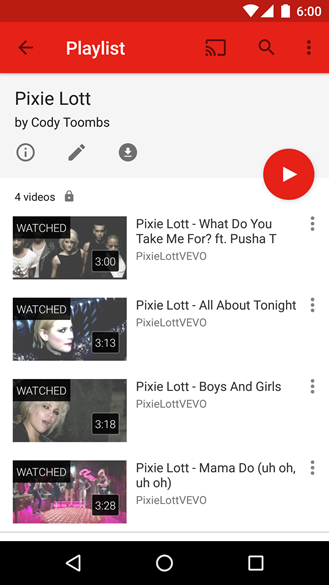 The Playlist and Watch Later screens have finally been modified to match the red and white theme found throughout the rest of the app. A few UI elements have also been moved around and the headers consume a bit less vertical space, but nothing has been added or removed. 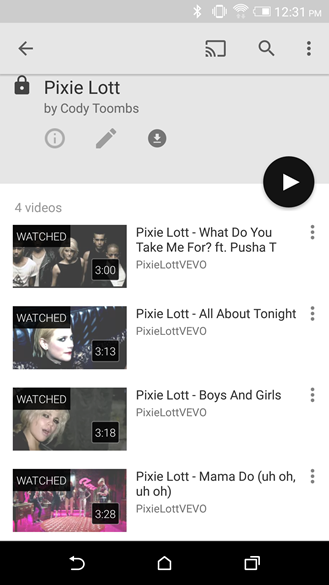 Users on Lollipop and above will also see the top-level tabs should have a subtle ripple effect when directly tapped. There may be a few other changes here and there, but these were the most notable. The title pretty much says it all: YouTube is going to get fast forward and rewind functions. A pair of familiar images named ic_player_fast_forward and ic_player_rewind make it pretty obvious that we can expect to see a couple of new buttons fairly soon. Both icons have already been added to the overlay controls layout, but they don't appear to be enabled. At least, I haven't been able to get them to show up on any video or playlist I've tried. There are also a pair of new strings for people with accessibility turned on, but they aren't actually referenced anywhere in code or layouts. The fact that they're not hooked up to anything is a good hint that this probably isn't ready to go quite yet. Maybe with the next update? The one thing that's not entirely certain is how this feature will work exactly. Play Movies & TV offers something like this where users can drag a finger across the screen for very precise control. On the other hand, these could be buttons that skip forward and backward by a pre-determined amount of time, say seven seconds with each tap. Yet another possibility is that they will actually change playback speed, which is harder to control precisely, but very effective for quickly scanning through a video. 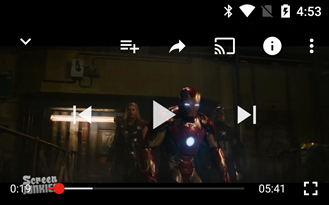 I'm not sure about anybody else, but I think this is great, if for no other reason than I hate to use the scrubber bar on any video longer than about 2 minutes. It's far too imprecise and tends to jump as you lift your finger. I'm certainly eager to see this launch as soon as possible. At least one person reports this is already showing up for him. 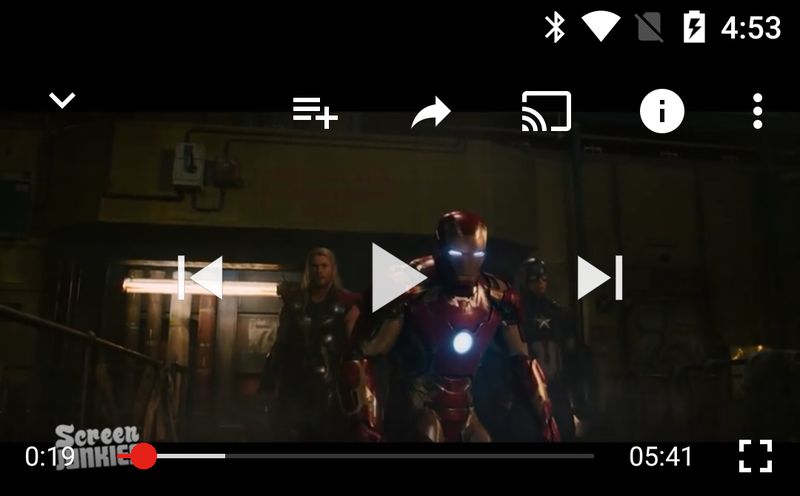 As described in a post on Reddit, the fast forward and rewind buttons skip forward or backward 10 seconds. Thanks, lolmastergeneral. Note: This video has been switched to private. We'll leave it in case it comes back. Another version of fast forward and rewind has turned up, and this looks like a more fluid form of scrubbing. It's not clear in the video, but it's probably controlled by dragging a finger over the video to speed up or reverse the play position. Take a look at it here. – Thanks, Ahmad Ouerfelli.